BACK IN 2003 Brent McIntyre took a neighbour along to a promotional evening in Southland for a new North American stallion shuttling to New Zealand. They both bought tickets in a raffle with the prize of a free service to the horse concerned, Mach Three. And, you guessed it, the neighbour, Steve Sloan, held the winning ticket. He didn’t have a broodmare at the time, but he borrowed Holmes Hanover mare Elleuro from his brother and got a filly from the mating called Mach N Elle. Brent took a half share and trained her at his Tussock Creek property. Mach N Elle didn’t win in eight starts but was good enough to run second on debut as a two-year-old and fifth in the big Cheviot fillies race at her next start. Brent took her first foal, a Bettor’s Delight colt, who was born at Macca Lodge. Named Darcee, he was sold to clients of Tony Herlihy’s stable at the national yearling sales for $32,000. The four-year-old had the biggest win of his career in the $23,800 North Island Country Cup Final at Palmerston North on 16 April, taking his record to six wins from 18 starts and $61,000 in stakes. Mach N Elle has proved to be a shy breeder. A year after foaling Darcee she left Machjagger (by Justa Tiger), a winner for Brett Gray this season, but has not been back in foal since. HOW’S THIS for a record. Panspacificflight has had only three starters in Australia, all bred at Macca Lodge in Southland, and they’ve won 11 times between them from just 25-odd starts. The latest winner across the Tasman is Last Flight In, who bolted in at Hobart over 2090 metres on 19 April. She won the way hot favourites should, blasting to the lead from the outside of the front line and coasting to an easy victory in a $7500 three-year-old race. Last Flight In won by 11 metres in a mile rate a touch over 2:00. She’s now unbeaten in two starts, winning on debut at Wyndham in February for Southland trainer Clark Barron before being exported. 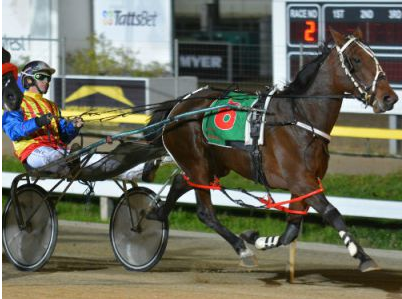 Just three nights earlier at Kilmore in Victoria, Sir Macs Man embellished his fine record in Australia, sweeping from last to first on the final lap of a 2180-metre event to win easily. Racing here as Macs Man, he placed twice from Kirk Larsen’s Southland stable before being sold. Now trained by Jodi Quinlan, he has won four from six in Australia and is destined for better things. And Panspacificflight three-year-old filly Glenisla, formerly trained by Tony Herlihy, has won five times for New South Wales trainer Shane Tritton. Interestingly, Last Flight In is a daughter of Washington VC mare Orse M Denario. Panspacificflight has clicked remarkably well with Presidential Ball mares in North America, so he looks a good match with mares by Washington VC, the Southland-based son of Presidential Ball. FOOTNOTE: Last Flight In won again in Tasmania on 22 May and now has a record of three wins, two seconds and a third from six life-time starts. THE CLARK BARRON-trained Southern Pursuit furthered the fine start Panspacificflight has made as a sire in New Zealand when he qualified at the Invercargill trials on 08 April 2015. The three-year-old gelding became Panspacificflight’s 19th qualifier from a first crop of just 23 live foals — a startling 82 per cent. It’s understood that at least two of the four horses not qualified have died. Clark went on to win on debut with Southern Pursuit at Gore on 27 April.